Hi! MikaelinhoFM here with the sixteenth episode of my first ever FM18 blog “The Bromma Boys” about Swedish talent factory Brommapojkarna, and I must say that I’m really loving both the save and this blog series. If you missed last seasons’ updates, do go back and read them through the links below. This episode covers the entire 2023 season. 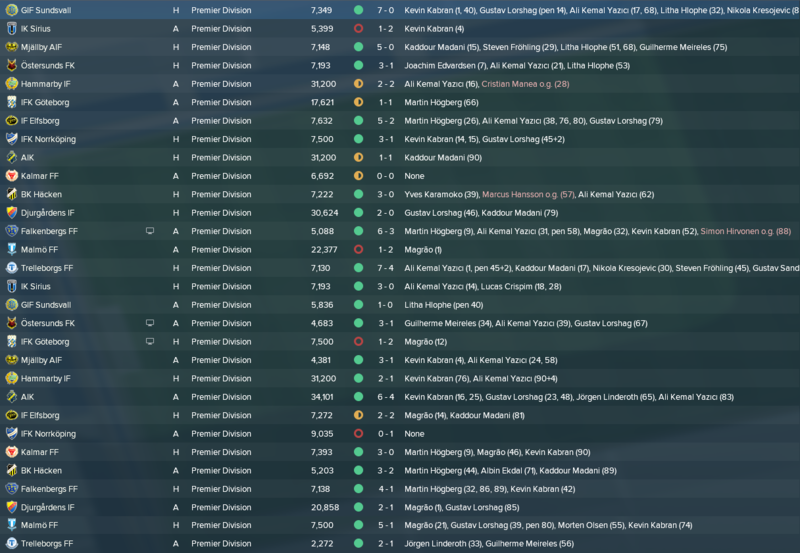 We come from the best season so far by quite the margin, where we finally managed to win Allsvenskan and also made it into the Europa League knock-out stage for the second season in a row. Hopefully this is the start of our Swedish Dynasty! We start this season off trying to progress to the next round of the Europa League, before starting an Allsvenskan season that will hopefully end up in a new league title! 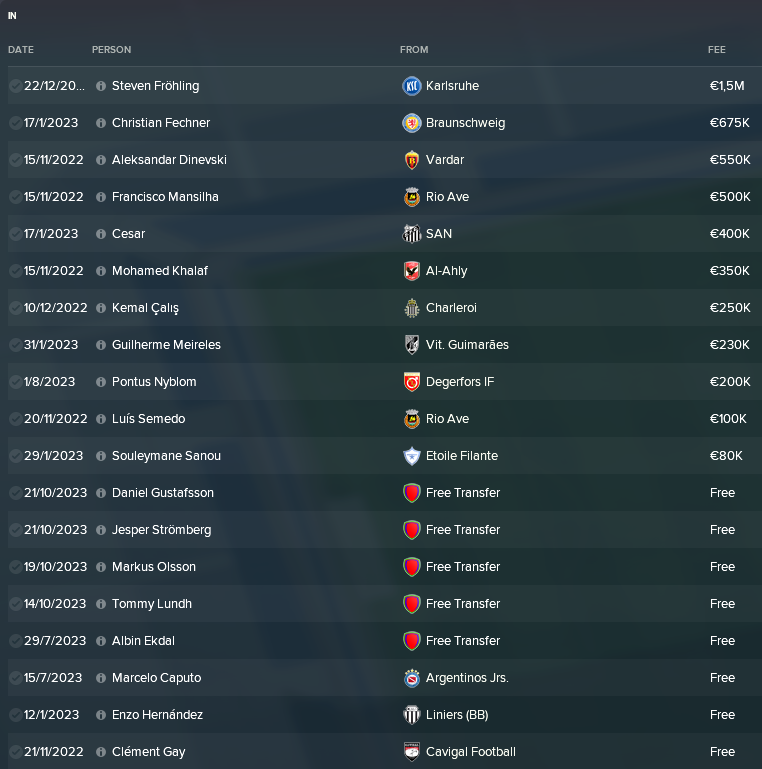 Lots and lots of hot prospects coming in, including the four players from our youth intake that I accidentally gave free transfers instead of giving contracts. Luckily they were all happy to sign for us again! One player stands out from the rest, as being quite far from 21 years old and that is Swedish international and former BP player Albin Ekdal! After leaving BP at the end of the 2007 season he has represented Juventus, Siena, Bologna and Cagliari in Italy before spending the last eight seasons with German side Hamburg. It’s always nice to welcome a club icon home, especially when he’s this good! At age 34 he’s naturally lacking some quickness, but he certainly makes up for it mentally. He will be a nice tutor for our young players and hopefully a nice presence in midfield. I hope to keep him in the coaching staff when he decides to retire as a player. Welcome home! We sold some players as you can see above. We’ll get back to Yazici further down. 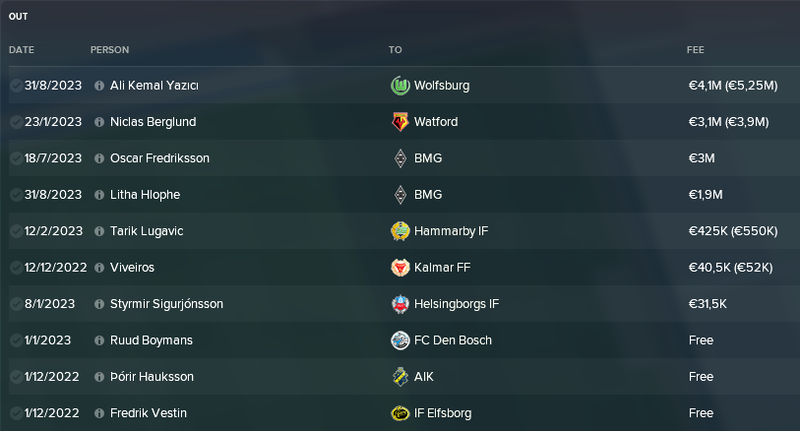 Young Swedes Berglund and Fredriksson had attracted some interest from European clubs and started kicking up a fuss when I rejected bids for them. When new bids above €3M came in I let them go. I was sad to see Berglund go, as he’ll probably become a regular for the Swedish national team. Litha Hlophe (aka Lisa Lopez with a lisp) had a €1.9M release clause and wasn’t interested when I offered him a new contract without it. Therefore there wasn’t much I could do when BMG met the release clause fee. I was sad to see him go as well, I’m sure he’ll become a great player! Since we managed to scrape by in the group stage last year we qualified for the knockout round where we were drawn against Espanyol, a tough but not impossible task. They had some nice quality player though, for example key man Gareth Bale! Away from home we lost, but managed to score a very important second goal in overtime. We then showed some nice quality winning 3-1 at home, meaning we were through to the next round. Here, we naturally got a tougher draw in French big club Lyon. They started at home embarrassing us with a deserving 5-2 win. We managed a draw at home, but were inevitably knocked out. I’m still proud, since reaching the 2nd knockout round is our best achievement in Europe as of yet! However, it definitely shows that there’s quite the difference between us and the better teams in Europe and I think we still have quite a long way to go before getting there. We got through the group stage without any real trouble. We won all of our games as usual after some decent performances, even though we needed a goal in minute 90+4 to beat 3rd tier team Sandviken in the final game. We got a tough quarter final draw against Göteborg, but we managed to go through on penalties. Sadly, the tables were turned in the semi final as we lost on penalties away to local rivals Djurgården. Disappointing, since I always want to win the cup. What a bumpy ride! We started the season with a bang, smashing Sundsvall 7-0, just to follow it up by losing 1-2 to Sirius. Somewhere around this time I fell victim to my biggest weakness as a manager, and I fell hard. I succumbed to my tactical impatience ending up using no less than nine (9!) different tactics over Allsvenskan’s 30 games. With eight games left to play we were down to a three team race with us, Malmö and Göteborg neck to neck. After a draw and a loss in the two coming games we were all of a sudden left behind, which prompted yet another change of tactics. This time we managed to build one that worked, producing all wins in the last six games. This was enough to secure our second title in a row, but what an emotionally draining season it became, primarily down to the fact that I kept changing tactics constantly! We got a decent draw in Finnish HJK in the play-off round. As predicted we managed to beat them quite comfortably, which meant that we got into the group stage and a nice €12M appeared in our bank account! Before we get into the group results it’s time for yet another rant. Have you heard the story before? Imagine this: We have a great youngster, bigger clubs become interested, I keep refusing laughable bids for my gem, making plans for his fantastic future at the club! Wait! What? What’s happening? Why are the board members here? No, leave my star alone! You’ve done what? Accepted a bid slightly lower than the one’s I’ve been refusing? Oh, I can protest the transfer, great! [Furiously clicking “Protest transfer”] What do you mean you don’t care about my protest? WTF board! Well, despite my sudden urge to resign in rage and throw my laptop out the window, I settled down and tried to guide the team through our first ever Champions League group stage. Well, the draw gave us a near impossible group with Atletico Madrid and PSG miles ahead of us. I was hoping for a third place finish ahead of Celtic for Europa League knockout games, but my hideous tactical experimenting saw us go down 0-6 away to them. Despite a win at home we finished dead last in our group. That ends our European adventure this season. Hopefully the experience (and the money!) will make us a stronger team in the next season. Young right winger Martin Högberg wins the Fans’ Player of the Year Award as well as highest average rating, most assists and most MoMs. What a breakthrough! Another great season for us! We are really building on our domestic dominance which is very nice. However it’s obvious that we’re quite far behind when it comes to the European scene. Hopefully the increasing ability of the players coming through our Academy in coming years will help us close the gap. In the next episode we will take an in-depth look at what’s been cooking in the Academy, aka the Talent Factory, during 2023. What new gems came through the intake? Will the graduating “Class of 23” be the start of a golden generation? What’s happening to Grass and Gear? The only way to find out is by reading the next episode!